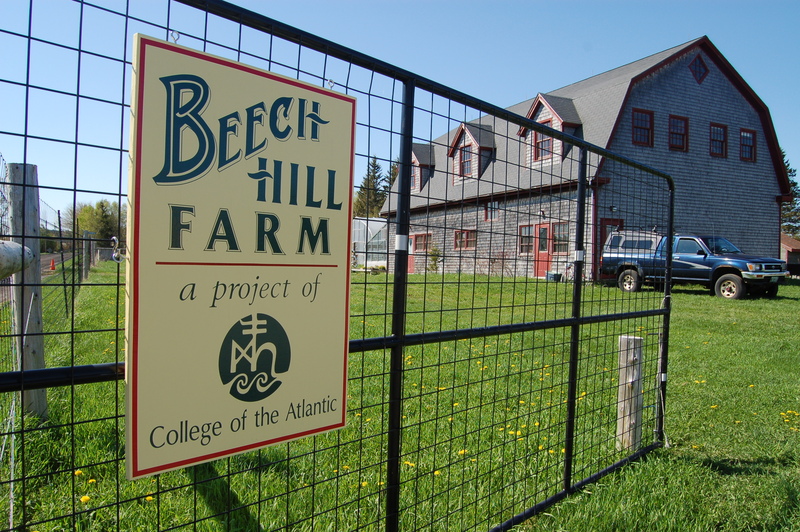 Beyond providing a valuable opportunity for students, the COA farm represents a commitment to a local, healthful, sustainable food system; it provides a source of employment for the local community; and, it provides two salaried management positions. This year, Alisha Jean, who has been involved with the farm since we were students there, has taken on the management position and, along with a co-manager Debbie, partner Jerzy Skupny, and a few other employees, is doing a great job it! 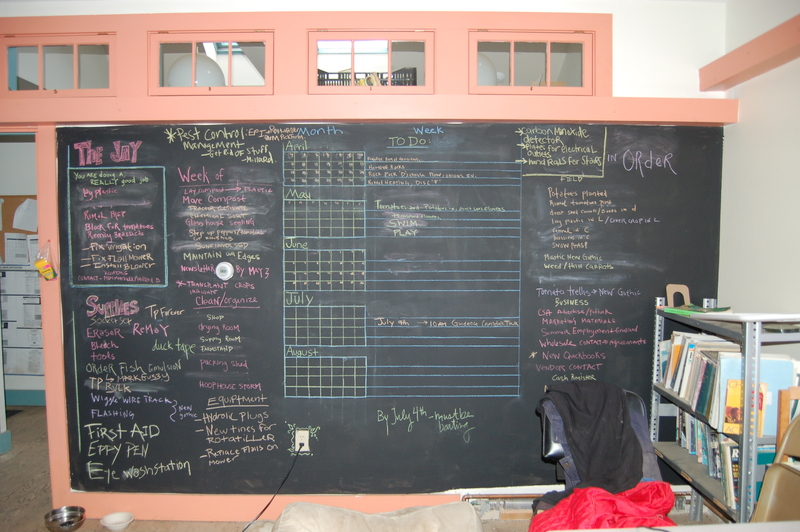 Above, a wall in the office has been converted to a black board for easy scheduling and coordination. 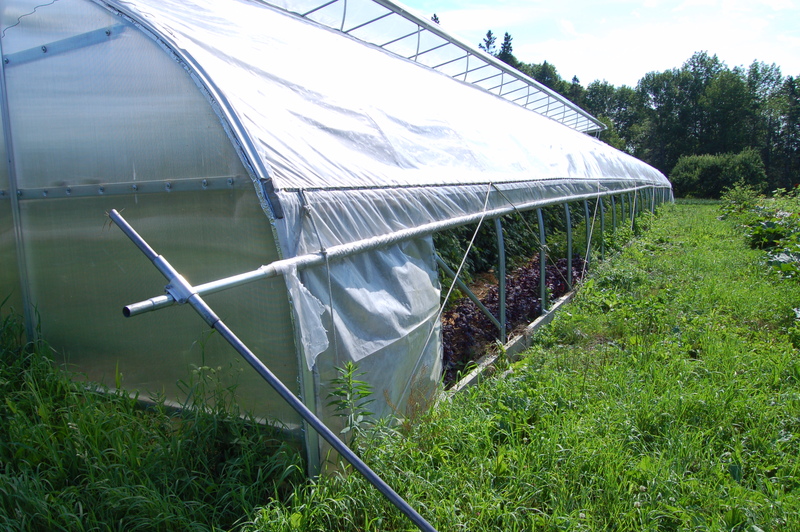 Above, one of the greenhouses with roll-up side venting. We really like the handle system shown here that is simple and looks like it could be put together pretty easily. 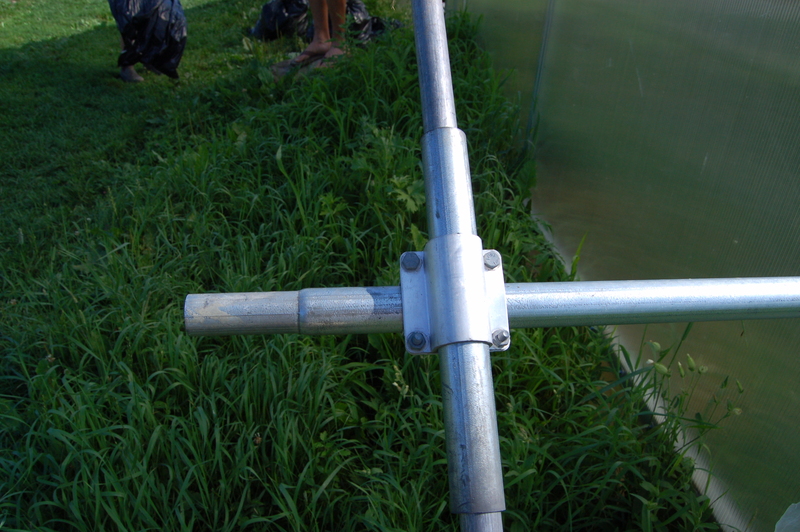 As shown below, the vertical cross-bar is able to slide through a larger diameter piece of pipe that is clamped perpendicular to the long horizontal pipe. The vent is easy to roll up, down, or prop open as shown in the above photo. 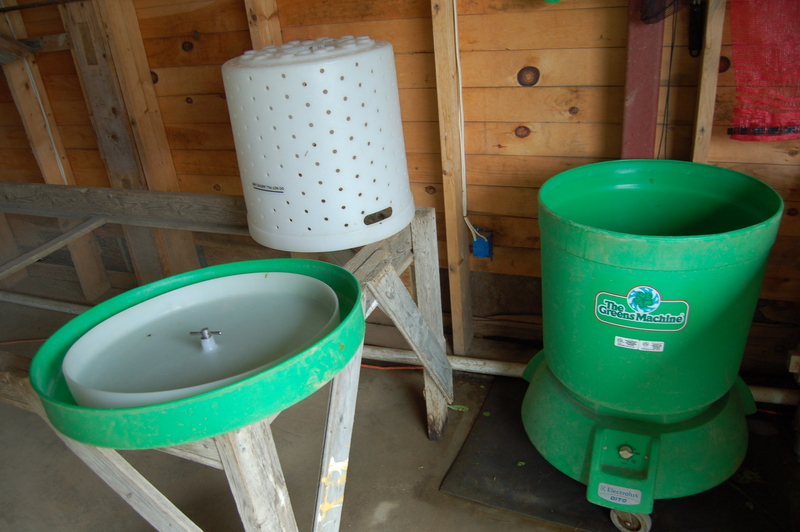 We have previously featured a few different options for salad spinning. Below, the Greens Machine by Electrolux, which retails for around $1,000 is the most expensive we have seen but not without its benefits: the white, 10 gallon capacity basket can handle a lot of lettuce mix and unlike a laundry washing machine (see Waldegrave post) it can be removed for quick and easy unloading. The green machine is also relatively light and, on wheels, easy to move around. Pictured below is a simple bucket drying rack mounted on the side of the tool shed. 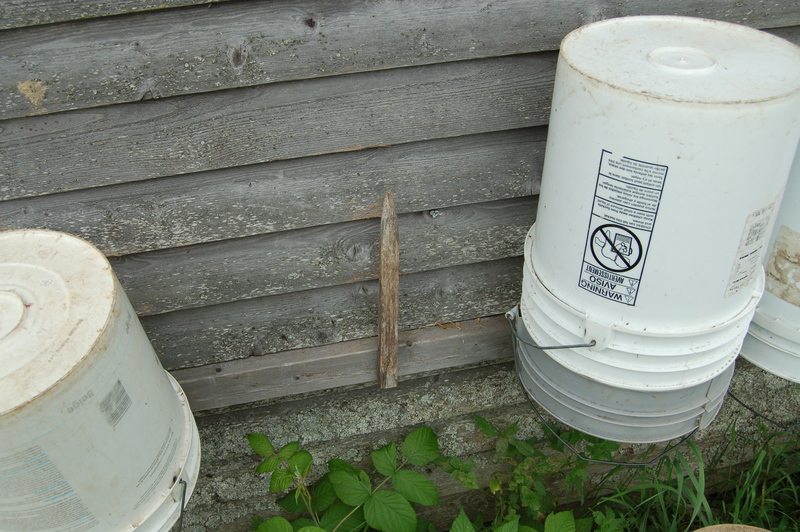 The horizontally mounted 2 x 4 has sticks attached vertically that hold any standard size bucket. And finally, below, the simple drying rack system in the upper floor of the barn makes really good use of space by stacking vertically. 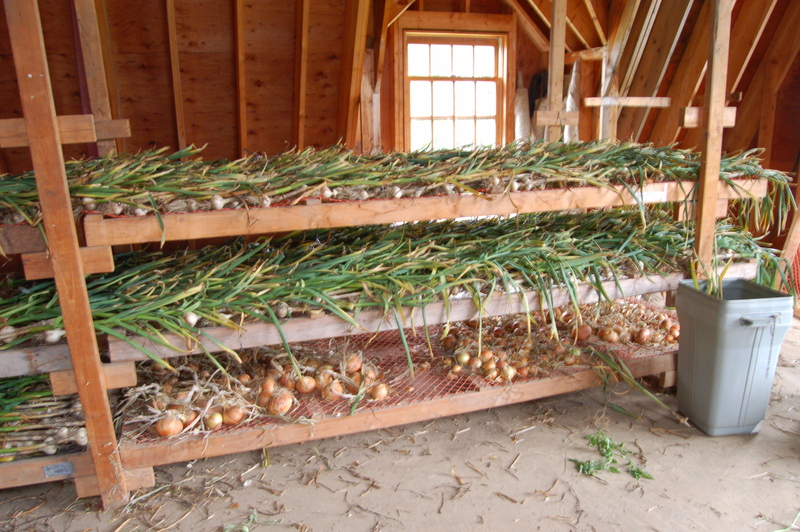 The rack is built of 2 x 4s and orange plastic fencing material which supports the garlic and onions. The horizontal holding trays are removable for ease of loading and cleaning. In order to ensure good air circulation they hook up a couple of fans. Thanks to Alisha and Jerzy for putting us up and to everyone involved for taking good care of the farm!